add a hint of milk or cream, a little salt a spoon of mustard and thicken it with flour and butter, boil and sent hot to table. Garnish. 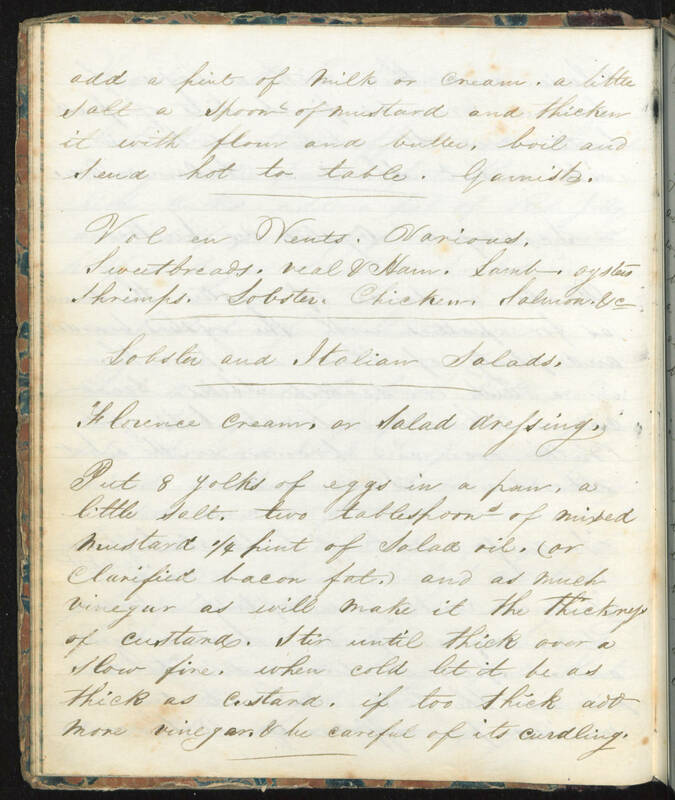 _____ Vol en Vents, Various, Sweetbreads, veal & Ham, Lamb, oysters, shrimps, lobster, Chicken, Salmon, & c _____ Lobster and Italian Salads, _____ Florence cream, or salad dressing, Put 8 yolks of eggs in a pan, a little salt, two tablespoons of mixed mustard 1/4 pint of salad oil, (or clarified bacon fat,) and as much vinegar as will make it the thickness of custard. Stir until thick over a slow fire, when cold let it be as thick as custard, if too thick add more vinegar & be careful of its curdling.